InnoGear 500ml aroma diffuser with a large capacity and decorative iron cover not only aromatize your home and office but also make the perfect addition to any decor, adding elegance, tranquility and beauty to enhance your living environment. LED illumination brings relaxing and romantic ambience which helps to enhance your mood for a happy and refreshed life. 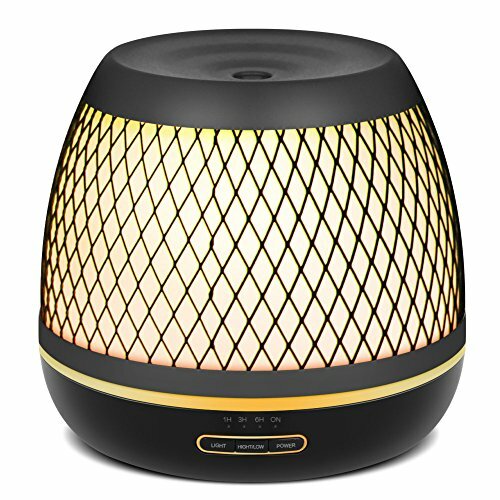 (1) 1st press - beep twice, the diffuser begins to work in weak mist mode with 1-hour timer; LED light will turn on and the color will cycle through automatically. (1) Press once to turn on the light at full brightness and the color will cycle through automatically. (2) The color will change per press. After 7 times to cycle through all the colors, the light will turn off when you press it again. 2. When outer lid is lift up, please place it vertically on the table, in case it rolls down and breaks. Larger Capacity: 500ml water capacity runs for up to 8 hours in high mist mode and 12 hours in low mist mode continuously. Modern Decorative Iron Cover: With elegant appearance of candle lantern, the diffuser is not only functionally perfect but also a wonderful way of adding retro style to your home. Timer Setting and Mist Control: 4 timer 1H/ 3H/ 6H/ Continuous modes. High/ Low button to set strong or weak mist (When you first press the power button, the default mode is weak mist with 1-hour timer). 14 Soothing LED Light Modes: 7 color mood lights to suit various environments. Each light is adjustable between dim and bright, so that you get 14 colors in total to meet different needs.